I don't remember ever not telling stories, though the first written story I can reliably date (because the main characters were usually the same age as me) was when I was eleven. I suspect I was drawn to writing because it was something I could do. I didn't have many friends, and my disability made sports and most hobbies difficult, but put me in front of a word document and I'm unstoppable. You seem to be drawn to sci-fi and fantasy. What about those genres speaks to you? The real world is awful - there are mean people, and buildings without elevators, and no such thing as time travel or unicorns! I think sci-fi and fantasy are kind of an escape for me. The world can feel like it isn't made for people like me, and that gets really depressing, but then there's Doctor Who and Firefly and Harry Potter, and everything is a little bit more okay. And with all those automatic doors and voice activated things, I'm pretty sure the Starship Enterprise is totally handicapped accessible. Not really. I just write as much as I can whenever I get the chance. How do you think your disability affects your writing? I have muscular dystrophy, which means my muscles are gradually getting weaker. Though I seem to have reached a plateau and haven't gotten much worse in recent years, it's reached a point where traditional typing is very difficult. I use an on-screen keyboard instead, which means I have to click on each letter I want to type. Add to that my attention deficit disorder that turns procrastination into an artform, and I'm surprised I get anything done some days. I don't read as much as I'd like to, but I recently discovered Jasper Fforde. His stories are amazingly bizarre, and I wish I could write like that. Circuits & Slippers, an anthology of retold fairy-tales with a science fiction slant, comes out today with your first-ever published story in it. Congratulations! What is your story about? Thank you! We're all very excited. It's hard to describe my story, Scrapefoot, without spoiling it, so I'll just describe it as "Goldilocks and the three mysterious shadowy figures who put her through weird tests in a cottage she can't leave." Do you see yourself and/or your writing differently now that your work has been published? Absolutely! The first time I opened an acceptance email, my life suddenly meant something. I might never be able to have a "real" job, and I'll probably always need the government to feed and house me, and there are always going to be people who think I'm stupid and talk to my mother instead of me, but now I know I have something to offer the world. I matter, my silly little stories matter, and I've never felt anything like that before. Have you experienced ableism in the publishing industry/literary community? Not really. I'm always afraid of what I call the "pity factor" - people being nice to me just because they feel sorry for me - so I don't go out of my way to mention my disability in my submissions. I have had bad experiences trying to go to writing workshops, with people whispering about food allergies as soon as I came in (because I must be sick and too stupid to ask about the ingredients before I eat a cookie? ), and everyone going out of their way to be super nice and include me even though I told them repeatedly that I didn't want them to. It's why I prefer all of my social interaction to be online. What are you currently working on? How is it going? I'm writing a novel about a woman in a wheelchair trying to survive the zombie apocalypse. I love The Walking Dead and Z Nation and anything zombie, but whenever I talk about what I would do in an apocalypse, I find myself saying, "If I could walk..." But I can't. Someone like me would have a really hard time in a world like that, no matter how mentally prepared she is. I don't know exactly where the story is going at this point, but I'm enjoying it. My main character is quirky and has quite the sense of humor. What is the best piece of writing advice you've ever received? She didn't mean it as writing advice, but my mother once said about The Walking Dead: "I'll accept that there are zombies, but since when can they walk up stairs!?" Ever since, I've been very conscious of where to draw the line with believability, and not to change the rules of the story just to suit the plot. Readers will accept spaceships, they'll accept that my main character can breathe fire, but maybe I should rethink the time travel that suddenly shows up in chapter twenty. 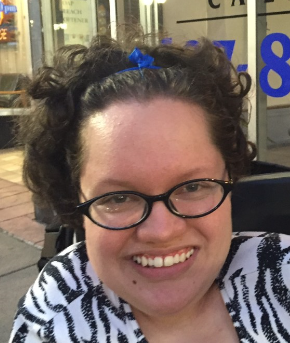 Biography: Jennifer Lee Rossman is a science fiction geek who lives in a world of her own creation (other people call it "Oneonta, New York"), where she crochets, watches Doctor Who, and threatens to run people over with her wheelchair.